WW1 Military Medal group awarded to 62886 Gunner Albert J. Chatfield who served with the 101 Siege Battery Royal Garrison Artillery. Chatfield was awarded his Military Medal in 1917 and was gazetted on 28th September 1917 which can be viewed by clicking on here. A paper copy of this entry can be supplied if required. Military Medal named to 62886. GNR. A.J. CHATFIELD. 101/SGE/BTY. R.G.A. 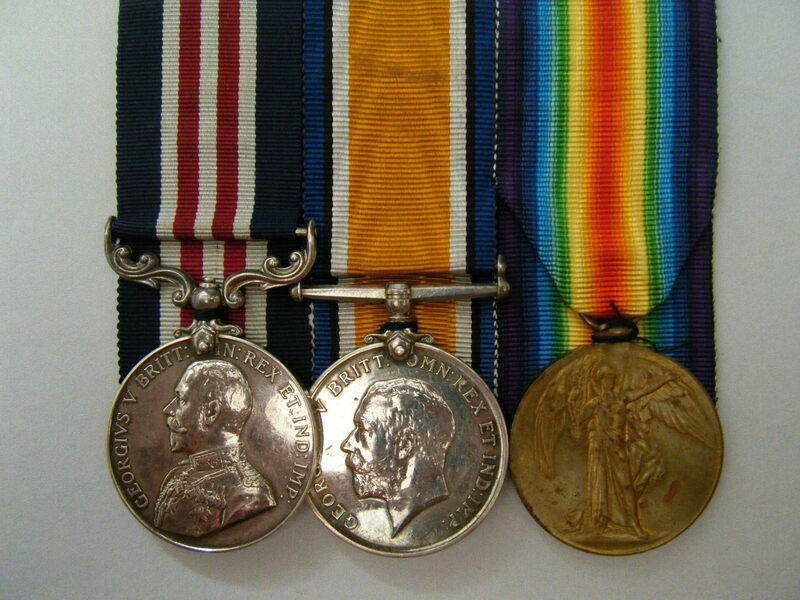 British War medal and Victory Medal named to 62886. GNR. A.J. CHATFIELD. R.A. 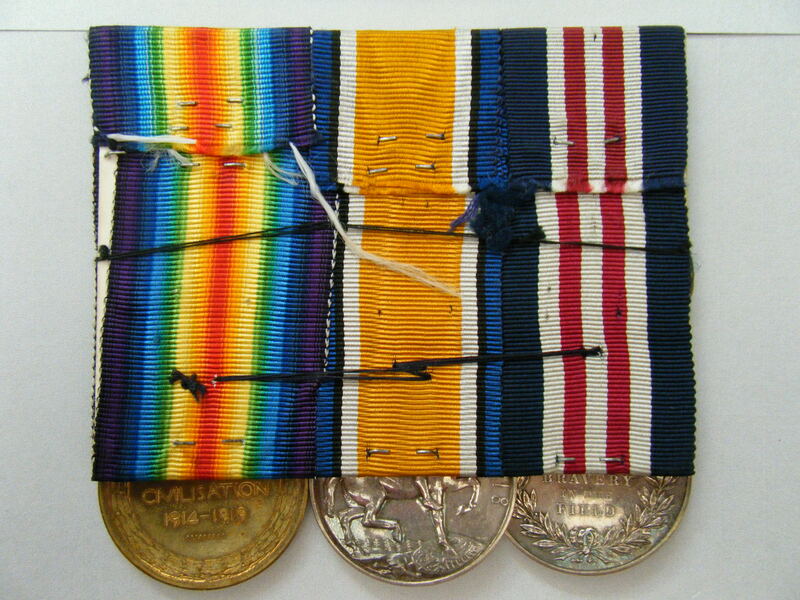 The medals are court mounted, and this listing includes a photograph of Chatfield in uniform. Included with this listing is a printed copy of the Medal Index Card which can also be viewed by clicking on here (if you have access to Ancestry). 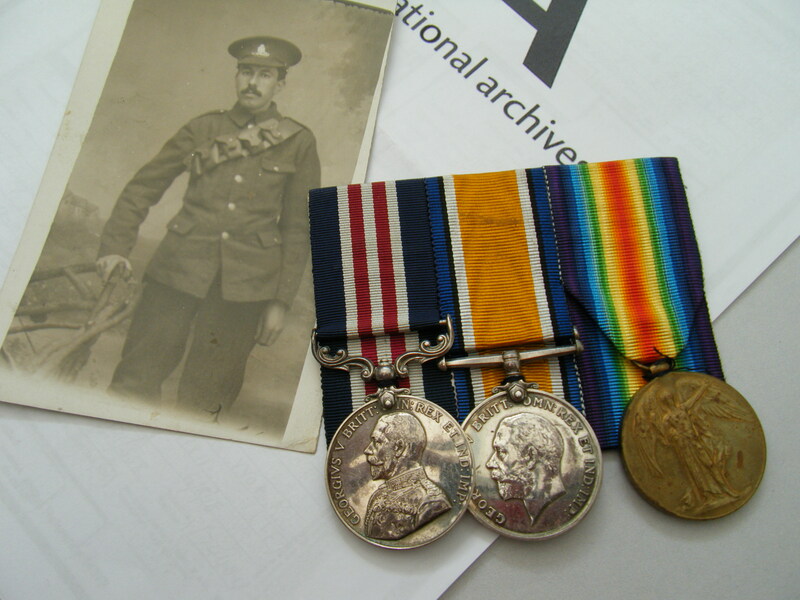 A link to the reference to his Military Medal ‘Index Card’, can be viewed by clicking on here, (again if you have access to Ancestry), however, this is a text only file so this listing also includes a paper copy. I have been unable to identify any service records relating to this man. The raising of eight new Siege Batteries (99th to 106th) of the Royal Garrison Artillery was authorised by Army Council Instruction 145/1916, with effect from the 13th January 1916. The Army Council Instruction stated that numbers 103, 104 and 105 would have the establishment of a battery of 12-inch howitzers, and the others would be that of 6, 8 or 9.2-inch howitzers. Siege Batteries RGA were equipped with heavy howitzers, sending large calibre high explosive shells in high trajectory, plunging fire. The usual armaments were 6 inch, 8 inch and 9.2 inch howitzers, although some had huge railway - or road-mounted 12 inch howitzers. As British artillery tactics developed, the Siege Batteries were most often employed in destroying or neutralising the enemy artillery, as well as putting destructive fire down on strongpoints, dumps, store, roads and railways behind enemy lines. The armaments of each battery will be given as details are added. The battery would normally be with three others, under command of a Siege Brigade. The brigade would also include an Ammunition Column of; Personnel: 3 officers and 104 other ranks, Horses: 13 riding, 2 draught and 72 heavy draught and Transport: 1 two-horse carts, 16 four-horse wagons. The brigade would also include its headquarters of; Personnel: 7 officers and 137 other ranks Horses: 21 riding, 5 draught and 72 heavy draught with Transport: 1 one-horse cart, 2 two-horse carts, 16 four-horse wagons. Following the aforementioned Army Council Instruction, the 101st Siege Battery Royal Garrison Artillery was raised in Sheerness and following training, this particular unit arrived in France on the 20th May 1916. In July of the same year they were supporting the 46th North Midland Division when the Division took part in the diversionary attack at Gommecourt on the first day of The Battle of the Somme, (1st July 1916), which - by all accounts - was a catastrophic failure resulting in heavy losses. Siege batteries moved around a lot as operational needs required, the image which can be viewed by clicking on here captures the unit at Merville during the Battle of Lys. The 101st ended the war as a part of 64th Heavy Brigade assigned to the 2nd Army.